For other places with the same name, see Hyderabad (disambiguation). Hyderabad is the capital of Telangana in Southern India, located on the banks of the Musi River and on the Deccan Plateau. Hyderabad and Secunderabad are "twin cities" near Hussain Sagar Lake (also known as Tank Bund in local parlance) but both cities have grown so much that now they have become one big metropolis. The city and district of Hyderabad are coterminous. Hyderabad district is entirely contained within the Ranga Reddy district of Telangana. 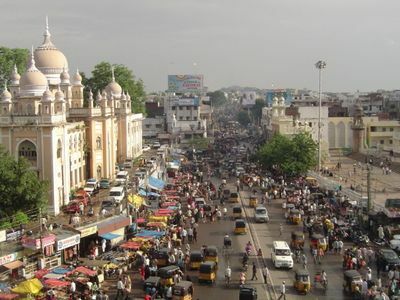 Many of the suburbs of Hyderabad were recently merged into the city, now called Greater Hyderabad. A city rich with history and tradition, Hyderabad now competes with Bangalore and Chennai for the crown of India's IT capital; Microsoft and Google have their India headquarters here. Many visitors never make it past the attractions in Old City, but you haven't truly seen Hyderabad until you have ventured out into the neighborhoods. The city is split into north, west, east and south of the central district. There are differences in culture visible throughout the city. The center of Hyderabad has upscale neighbourhoods along with several venues of entertainment and dining. There is lots to see and do as well. 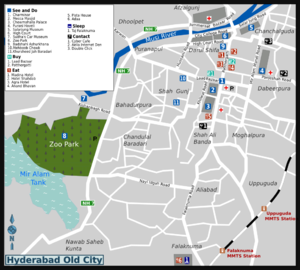 This is where most of Hyderabad's famous historical sights are. Also called Old City or Purana Shahr, the South Zone is home to Hyderabad's most lively and authentic shopping experience. The Taj Falaknuma, an erstwhile palace now converted into a luxury hotel, is in the South Zone. The North Zone is the erstwhile British Cantonment area of Secunderabad. Completely different from the South Zone, this zone is far more cleaner and organised than the former. This is home to the newer CBD of Hyderabad. If you're in Hyderabad for a business trip, you are most likely to end up here. Home to a lot of educational institutes, this region will be the first to see a Metro line run through. If you are traveling to Hyderabad on business — as is increasingly the case now — it is easy to miss the 400-year-old Hyderabad. The city that immediately hits the eye is a sprawling metropolis of shopping malls and office buildings with glass facades. The whole of the city seems to be under construction or renovation and the roads are jammed because flyovers are being constructed. It is a magnificent city in many senses. Around 1763, Asif Jah II, defeated by the Marathas and threatened by Tipu Sultan of Mysore, entered into a subsidiary alliance with a British. Hyderabad state became a "princely state", protected by, and under the overlordship of the British. The British maintained their army in nearby Secunderabad to protect the Nizam and to ensure that he did not do any mischief. Hyderabad state was the richest in the country and in the 1930s Time magazine rated the Nizam the richest man in the world. In 1947, with India's independence, the seventh Nizam was reluctant to cede his principality to the newly independent India, preferring Pakistan instead. India sent in its troops and the 200 year old prophesy was fulfilled. On September 17th 1948, it was merged in to India. Hyderabad become the capital city of Hyderabad state till November 1st 1956. After forced merger of hyderabad state with Andhra state and formed new linguistic state Andhra Pradesh on Nov 1st 1956. Thus, Hyderabad became the capital of the newly formed state of Andhra Pradesh. The new capital's administrative buildings were located around Hussain Sagar Lake, approximately between Secunderabad and the "old city", as the Nizam's city came to be called. 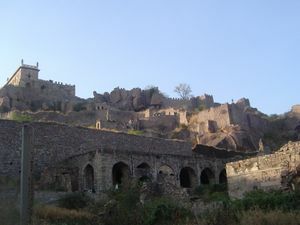 The Old city lies mostly on the south bank of the Musi, though this guide will treat the Golkonda, which lies on the north bank, as part of the old city. Most historical attractions, including the Charminar lie on this bank. Secunderabad lies to the north-east of Hussain Sagar lake. This has historically been a military cantonment, which means that the roads are better maintained and broader. It has nice parks, open spaces and some excellent restaurants. 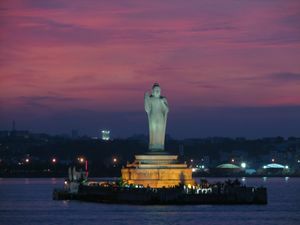 The New city, which contains the administrative offices of Andhra Pradesh lies on the north bank of the Musi, to the east and south-east of Hussain Sagar. Punjagutta to Gachibowli is a vast region to the west and north-west of Hussain Sagar, on the north bank of the Musi. This has developed in the past twenty years. Areas of interest here are Punjagutta and Ameerpet, which are enormous shopping areas. Banjara Hills and Jubilee Hills is where Hyderabad's swish set lives, and contain some good parks and restaurants. The newly developed "Hi tec city" and Gachibowli are 9 km to the west of the new city. This is where most technology and business process outsourcing (BPO) firms have their campuses. Due to a recent influx of young men and women from various parts of the country for better job opportunities, Hyderabad's culture and attitudes have taken a turn towards "modernity". However, it is good to keep in mind that the city is still a deeply conservative place and to dress appropriately, especially in the old city. Telugu (the state language of Telangana and one of India's six living classical languages) and Urdu are widely spoken in Hyderabad, and most educated people speak Telugu, Urdu, Hindi and/or English. Hyderabad's new Rajiv Gandhi International Airport (IATA: HYD)  is located 22 km (14 mi) from the city. Note that the old airport at Begumpet is now closed, except for use by VIPs. The sleek and well-organized airport is one of the best aviation facilities in India. The elevated expressway to the airport is now open and takes 20 minutes. Direct international connectivity from Hyderabad is available for many countries. International carriers operating from Hyderabad are Air India, British Airways, Emirates, Malaysia Airlines, Air Asia, Oman Air, Qatar Airways, Saudi Arabian Airlines, Silk Air, Etihad Airways, Cathay Pacific and Thai Airways. Domestic connectivity is excellent with Indian airlines operating from here including Air India, Air India Express, Indian Airlines, Indigo Airlines, Trujet and SpiceJet. Hired cars are also available from a booth just before walking outside of the airport. This gives you the advantage of paying in advance, thereby avoiding any disagreements over price.The airport can be contacted on their (toll free for BSNL/MTNL subscribers) number 1 800 419-2008 for all services and inquiries including arrivals / departure information, facilities, transport availability, etc. Indian Railways  has service to Hyderabad from all over India. Hyderabad is well connected to other major Metros by road. Bangalore is connected by NH7 and is at a distance of 560 km. The city is 752 km from Chennai (using highways NH9 and NH5) and 800 km from Mumbai (NH9 till Pune and the expressway to Mumbai.) The BangaloNorth-South section is part of the North South corridor which is being upgraded to a four-lane divided highway Through Hyderabad daily peoples visit to Srisailam Jyothiling. Hyderabad is also known as Hub of Business. Hyderabad is well-connected to all parts of the Telangana and most parts of South and Western India. Both state government and private buses operate large number of luxury and ordinary services across the state and neighboring states. JBS, (Jubilee Bus station), is in Secunderabad. TSRTC runs direct A/C coaches to Mumbai, Bengaluru (Bangalore) and Chennai. Telangana tourism runs A/C coaches to, Mumbai, Chennai and Bengaluru. You have to book the tickets in advance. There are many online bus ticketing portals to book bus tickets. Mybustickets is one such portal. MGBS or Imliban, is said to be the largest bus station in the world with around 84 bus bays side by side. TSRTC has pickup and drop points from various points in the city. In addition, government-run bus services of neighboring states also run buses to Hyderabad, as do various private companies. Private Buses. South India is largely well served by organised private bus operators. They run luxury buses like Volvo, Mercedes, Kinglong Cerita buses including multi axle buses. These are air-conditioned, semi sleeper or sleeper services with online ticket booking facilities. Important private travel hubs are KPHB Colony, Lakdi-Ka-Pool, Paradise centre in Secunderabad and Dilsukh nagar. Luxury services run to many cities from these places. Non-metropolitan areas and towns are often connected by non-A/C buses but are still provided with comfortable seating. There are many ways to get around in Hyderabad. It has good bus service, good autorickshaw service (although they never charge by meter and always overprice, making cabs cheaper) and well-developed Radio taxi services as well as new app-based services such as Uber and Ola. There is a local train service too, but it is grossly inadequate and unreliable. It is advisable that travelers using smartphones download the Hyderabad Police and Hyderabad Traffic Police apps from the app store, as these have some safety features such as an SOS button to the control room, as well as options to lodge complaints. Hyderabad has good local bus connectivity and is run by TSRTC , a state-government owned corporation. Most intercity buses start and end at the Mahatma Gandhi Bus Terminus more commonly known as Imlibun, and there are numerous depots where city service buses start and end. One can use Google maps to plan travel by bus. There are five categories of buses (Ordinary, Metro Express, Metro Deluxe, AC, Volvo AC). The Volvo Buses are the most comfortable, with fares starting from Rs. 35. There are also monthly passes of Rs. 2100 that allows one to travel anywhere any number of times by any service across the city). Other buses tend to get extremely overcrowded and traveling on the footboard of a bus is very common. The routes displayed on buses are normally shown in at least two languages, one of which is English. The best way to get to a location by bus would be to get to a bus stop and ask people waiting there. You could also get on a bus going in your direction and ask the conductor for help. Autorickshaws in Hyderabad should be metered, though it can be difficult for non-locals and locals alike to find an autorickshaw driver who ever agrees to a metered fare. (This is especially true when hailing an auto in front of a 5-star hotel, near bus stands, railway stations and near Hi-Tech area.) However, Traffic police are very helpful and will help engage an Auto with metered fare. Autos can carry a maximum of 3 passengers excluding the driver, but it is common to find them being overloaded to carry up to six passengers when one. The minimum fare is Rs 20 which covers the first 1.6 km. Each additional km is another Rs 11. The waiting charges are for Rs. 30 per hour. There are also shared 4 seaters and 8 seaters Maxi Vans available to and fro from the suburbs to the main location of the city in that direction. Fares are mostly 2 rupees more than bus fares but are far more comfortable and fast for short distances up to 5 km. Fix the fare before you step into the autorickshaw. Auto Drivers in Hyderabad are a nightmare and are absolutely uncooperative. Finding a needle in a haystack is easier than finding an auto driver who agrees to go by the metered rate with a common excuse that their meter is not functioning. They always demand a much higher fare even though the fare has been increased from time to time. It is advised to keep extra change with you since most of the auto drivers will claim that they don't have change, even if they have. If you have a choice then always opt for a Prepaid Cab. Reckless driving and accidents are very common here, as is the case with most cities in this part of the world. Most of the auto drivers want you to check out pearls shop (which they claim are authorized by the Govt.) in exchange of less fare however they are okay if you don't buy anything from these shops, just sit there for 10 minutes. They are encouraged with incentives to bring customers into these shops. The pearl shops are notorious for persuasive sales tactics and they won't let you out easily. So pay the complete fare to auto drivers instead of being diverted to a pearl shop. Auto drivers get some percent of the entry fees (around Rs. 10/-) if they take you to the places like Chowmoholla Palace or Salarjung museum for free. If you are around these areas get into some auto instead of walking down and ask them to drop you there. Also in many parts of the city, it is easy to find a shared auto running, just reach the nearest bus stop and ask the locals for a shared auto, they should readily guide you. If u see an overloaded auto-rikshaw, it is a shared one and you just need to wave at the next less-populated one. Auto Drivers in Hyderabad are especially reckless drivers. Better book a cab than take an Auto, even at a higher price, for the air-conditioned comfort and protection from pollution, as well as for relief from the antics of the 'Auto wallahs'. There are exemplary auto drivers too, but unfortunately, the others outnumber them by far. It is best to use new app based cabs such as Ola and Uber, which assure service and courteous drivers. However, there have been cases of misbehavior by drivers (although few) and it is advised to use the Hyderabad Police app and enter the details of the cab you are getting into, to be safe. Fares for these start at Rs. 6 per km and Rs. 1 per minute of ride time. (Ola Micro). Availability is very good at busy locales, and most apps have tracking features as well as SOS features. Metered Radio taxis are available, but they cannot be hailed off the street. One needs to call their centralized call center and book the service. Service is very good, especially if you are looking for longer distances. It can be next to impossible to be able to get a Radio cab without prior booking since demand far outstrips the supply. All metered cabs have digital meters that show the distance and fare. Operators offering metered taxis at Rs 10 per km (Most of them are now charging Rs 12 per km for an Indica, Rs 10 continues in case of Maruti Omni) with a minimum charge is Rs 80 in most cases. Many taxi services prefer not to book trips that are only a short distance. It is preferred to use travel curators like Vayu Travels for customized itinerary planning and comfortable travel. However covering the entire city with so many sightseeing locations will be costly on a CAB, whereas hiring a Full Day Taxi / Car is suggested, which normally charge on 8 hrs or 80 km and 10 hrs 100 km basis. One can easily hire cabs for local tours in Hyderabad with some prominent car rental services which would normally cost around Rs 9/Km (along with Driver). Local trains called MMTS are available, albeit only for a few places Places in Hyderabad, The frequency ranges from 10 to 30 minutes, except during day time and Sundays, when there are fewer trains. It is a fast way of travel to the few stations it covers, and the cheapest option as well. If you plan to travel through MMTS check out the schedule on the website MMTS Train Timings, . If you are foreign traveler it is advisable to take first class. General class tend to get overcrowded and you can never find a seat at intermediate stations. If you have to catch a train do not rely on the MMTS schedule, as it is rarely followed and usually late; Trains may also get cancelled without prior notice. Daily and monthly passes are also available at the MMTS stations. The metro network includes 3 lines covering a distance of around 66.56 km. Out of this, a network of 30km. was thrown open to the public on the 29th of November 2017. The currently operational stretches are: a) Nagole to Ameerpet: 19 km and b) Ameerpet to Miyapur: 11km. The entire 66.56 km 57-station first phase is due to be completed by December 2018. Hyderabad lacks an expressway system, leading to traffic jams during rush hours. However, an 160 km Ring Road Expressway  is currently under construction. Driving is exciting in Hyderabad not unlike in the rest of India. You find cycles, motor cycles, rickshaws, hand carts, autos, share autos, mini trucks, buses, vestibule buses, double deckers, Volvos jostling along. There are long stretches of roads passing through thickly populated areas that have no median breaks, so vehicles, including motorbikes and cars, simply drive on the wrong side of the road. Several modern flyovers now link the arterial roads. Several car rental agencies are available at the Rajiv Gandhi International Airport as well in the following locations. 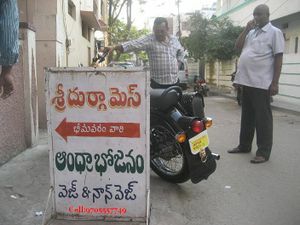 In Hyderabad you can rent motorcycles and scooters to get around city and outstation trips. roadpanda You can rent two wheelers (motorcycles and scooters) on hourly rental basis from roadpanda. The Telangana Tourism department runs a hop- on hop- off  bus service that takes one around the city. Hyderabad's interesting districts are fairly spread out, but are enjoyable to explore by foot on their own. The Old City is composed of a maze of disorienting alleyways that expand outward from the Charminar. Getting lost in the markets (where you can buy anything from hand-sequined saris to freshly slaughtered goats) and alleyways in the Old City can make for a thoroughly enjoyable afternoon. The famous Chudi Bazaar (Lad Bazaar) across from the Charminar is a chaotic tumble of goods, people, animals and vehicles are navigated quickly on foot. The Chowmahalla palace and the Mecca Masjid are both easily accessed from the Charminar. Necklace Road, Sultan Bazar (Koti) and Abids are worth taking some time to wander around. Please note that walking can be hazardous in Hyderabad. It is common for roads to be missing pavement, or simply unpaved, and bikes and autorickshaws may go to right up to the edge of the road and climb any barrier to get ahead in traffic. Walking alongside and crossing the road can be very dangerous and it is important to stay alert for erratic driving. It is always advisable to use the foot-over bridge if there is one available. Hyderabad has many historical mosques. Durgam Cheruvu (Secret Lake) - this is quite close to Hi-Tec City area and now hosts various parties and events. It used to be a real hidden gem in the busy city but it is still a nice lake to sit around. Shamirpet 24 km away to the north of Secunderabad, Shamirpet has a beautiful lake and a deer park. The peaceful environs make it a great picnic spot. TS Tourism offers comfortable cottages facilities for accommodation (under private management) while the forest lodge can be booked with the TS Forest Department office at Saifabad. Saroornagar - this lake is very famous as it has been lined by a solid strong wall on one side recently. A two lane undivided road is laid over this wall. The road is neat and exciting to drive. It has abundant lighting during nighttime and large pedestrian space provided. A problem is 'eutrophication' which is caused due to water hyacinth. A pleasant space for young couples to spend their evening. Smells sometimes, but that is the nature of any waterbody in a metropolis. Another important event that takes place is 'vinayakachaturthy', (a festival for Hindus in which Lord Vinayaka's statues are immersed (and thereby dissolved) in water). All roads lead to saroor nagar lake on the day of the Lord Ganesh's nimajjanam. Necklace Road. 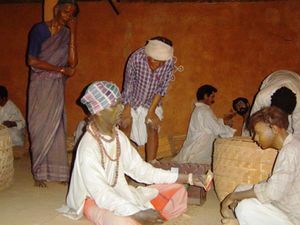 The Chaupati of Hyderabad. Indira Park. A sprawling 76 acre park located near Tank Bund with a nice little pond and boating. 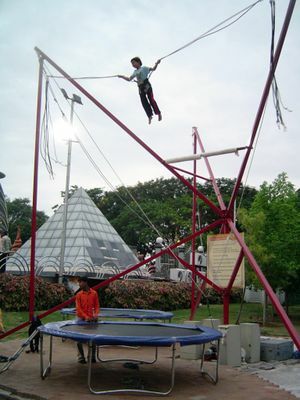 Lumbini Park - It also offers nice Laser Shows in the evening which is first in India. The bad news is this has been almost occupied by some people and there is no surprise if you don't see this. Recently, there has been a great rise in the number of complaints about harassment of innocent tourists in various destinations around the country. The Ministry of Tourism has adopted a strategy of introducing Audio Guide Devices at various places of interest around the country such as the Taj Mahal, Agra Fort, etc. to provide reliable and factual information to tourists. It is wise to hire such devices as you can avoid being ripped off or ambushed by desperate touts itching to make a buck. The Ministry of Tourism has also announced its partnership with AudioCompass, a company specializing in creating Audio Tours of all places of interest in the country including Hyderbad, Golconda Fort, etc in the form of Audio Devices available at the monuments and Smartphone apps that can be download from the App Store. Runway 9 ☎ +91 98 8533 3160, +91 98 8533 3170. This park offers archery, air rifle (BB gun) target practice, and go-cart racing on a track with tight corners. 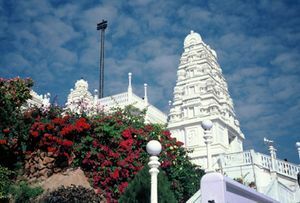 Ramoji Film City holds the record for the world's largest film studio, though most of the shooting takes place outdoors. Many Telugu and Hindi films are produced here. Tourists can tour the studios and there are two hotels. It's a 1 hour drive east of the city. GoGoa Acquarium is an exhibition of rare Sea water animals including Star Fish and Quran Angel and showcase of the Goan Marine/Aquatic life. Entry is Rs 100 for adults and Rs 50 for children. This place is on the Vijayawada Highway, 3 km from Ramoji Film City. Friends of Snakes Society, For reptile conservation work and field trips. ☎ +91 8374233366/77/88. For an insight into the contemporary cultural landscape of the city, do visit Lamakaan where various theater group perform in Telugu, English and Urdu/Hindi languages. This is also a good place to meet localities. Park View Enclave Tennis Centre, Boinpally Secunderabad. ☎ +91 40 3296 0203. Bodhi Sampanna, ☎ +91 98 663 24910, ([email protected]), . The centre, whose name means 'an abode endowed with Bodhi', is a centre for the study and practice of Mahayana Buddhism following the lineage and example of Lord Buddha. Bodhi Sampanna was founded in 2009 and is a part of Dharma Megha Foundation The Centre offers courses in various Buddhist meditation techniques and teachings on different aspects of Buddhism. Teachings are offered free to the public and are conducted in English or in Tibetan (with translation in English). Sri Kamakshi Jewellers & Pearls, #4-1-970, C-18, Ahuja Estate, Opp Santosh Sapna Theatre, Abids Road . Phone: +91 40 6636 3800 & +91 9849041031. Pearls of Hyderabad, (Abids and Somajiguda Jewellery shops). Choose from 3 varieties, natural pearls, cultured, and imitation. Mohal Jewells. On the Golden Mile Somajiguda for Pearls, Silver, Gold. phone=" +91 40 2341 9757"
The Golden Mile of Hyderabad for shopping, consisting of shopping plazas, Malls, Designer Boutiques and upmarket shops - Starting from Lifestyle near the Begumpet Flyover and extending all the way till Road No.1 Banjara Hills. Bidri Crafts, (Gunfoundry, Abids) ☎ +91 40 2323 2657, +91 40 2323 3663. Vishwakarmarts gallery. Esteemhouse opposite to model house in Punjagutta Dwarakarapuri colony, ☎ +91 40 6661 5039 . Shilparamam. (Also Known As Night Bazaaz), Madhapur. Exhibitions of handicrafts. "United Designers, Banjara Hills Rd#4. Designs by a new wave of young Hyderabadi fashion designers, they also have natural hand-made soaps for body and hair. Mon- Sat 10:30AM-8PM, ☎ +91 40 2335 5441, +91 98 85404944. Laad Bazaar, (next to Charminar). Exotic lacquer and glass bangles market. Madina Market Bazaar. Wholesale market. Gulzar House. Retail market for ladies. Sultan Bazaar. Wholesale clothes market. General Bazaar. Budget clothes shopping. A popular dish of Hyderabad is biryani. Ask anybody about their favorite dish of Hyderabad, and they will definitely tell you Hyderabadi biryani. It is prepared with a blending of Mughal kitchen and the style of cooking practiced by the Nizams. Hyderabadi biryani has a distinct aroma. Beautifully garnished with pudina, fried onion & boiled eggs. Mostly it is served with dahi-ki-chutney and mirchi-ka-salan. Biryani has many variants like mutton biryani, chicken biryani, biryani khaam, biryani zard or zafrani or the most exotic of all joban malti biryani in which mutton, partridges and quails were cooked with rice. Gosht, which is made from a buck/billy/young goat, and is associated with the Hyderabadi cuisine. Hyderabadis prize the meat of a male goat. Kachchi gosht ki biriyani, of Hyderabad, where raw meat is stir fried with spices (masala) for a couple of minutes and then covered with rice and put on dum. Today, Biryani is also made using vegetables, chicken, seafood and beef. The beef Biryani is known as Kalyani Biryani, available at many small eateries in the city. Although any Irani cafe might serve this delectable dish, there are a few places better known for tasteful food than their hygiene. 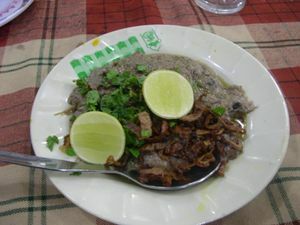 Hyderabadi Haleem, is another dish which is available only in the month of Ramadaan (Ramzan). Mirchi ka salan, served with spicy chilly gravy, is another dish that serves as a tasty accompaniment to any rice item. Khubani ka meetha, is Hyderabad's preferred dessert sweet. It is made from apricots boiled in sugar syrup till they achieve a thick consistency. It looks similar to, but tastes different from gajar ka halwa (carrot halwa). It is often topped with ice-cream or cream. Double Ka Meetha, is a dessert made from bread, milk and dry fruits. Falooda, is a favourite drink of Hyderabad. Irani chai is the tea of Hyderabad, available at any of the ubiquitous "Chai" shops. Although, not all of them have the best hygiene and it is best to go with a local. The crowd at the stalls is composed mainly of blue collared workers and college students so expect a noisy environment with conversational topics that range from movies to politics. Street food, in Hyderabad is better than most other cities in India and it is cheap. Gokul Chaat in Koti is a well known and pretty popular joint for snacks like Samosa Chaat, Dahi Puri and Sev Puri. Amazingly tasty Rajasthani street food (Kachori, Samosa and Aloo Mirch) is served by Rajasthan Namkeen Bhandar, also located in Koti (diagonally opposite Womens College bus-stop). In recent times, there has been an explosion in the number of restaurants in Hyderabad, fueled by demand from young professionals with money to spend. Quality and variety of food, however, has not kept pace. There is a disproportionately large number of restaurants that aspire to be called "fine-dining" restaurants, but the food they serve is usually indifferent. In general, keep away from restaurants that call themselves "multi-cuisine" or if you see multiple cuisines on the menu, as the chances are that they are attempting to serve every kind of palate and will not satisfy any. Hyderabad has a large number of outlets that are positioned as bakeries. These are primarily takeaway places, where one can buy sandwiches, burgers, biscuits and puffs to go (called parcel in local parlance.) Usually, there are a few chairs and tables thrown in as an afterthought. Many Western chains have set up shop in the posh areas of Hyderabad. Among these are Texas Chicken, McDonald's, KFC, Pizza Hut, Dominos and Subway. Most of these have multiple outlets and all of them have Indianised their fare to varying extents. The Indian pizza chain Pizza Corner also has many outlets. Barista, Cafe Coffee Day  and Java Green  outlets are good places to have coffee and conversations. Pulla Reddy Sweets, is an iconic chain of sweet shops. The outlets are found all over Hyderabad and are so popular that it has spawned imitators who copy the distinctive yellow signs and choose some variation of "Reddy" (a common last name in Andhra Pradesh) as the name. Karachi Bakery, Mozamjahi Market and Road No.1 Banjara Hills. edit famous for biscuits. WARNING: Drunken driving is not tolerated and police enforce the rule strictly. After 11PM almost all the roads have police patrols and check drunk driving. If caught you may end up paying fines, apart from vehicle being seized and couple of rounds to police station in worst scenarios. Some of the good pubs and bars are part of hotels, and they have been covered along with their hotel listing under Sleep. H20 Amrutha castle, (near lumbini garden). Rs 150-300. Club8, Lifestyle building Ameer pet, cheap beer, usually have a (1+1) offer available before 7 PM. Cloud9, ICICI bank near old airport. Have dance floor but not a very good crowd. Hard Rock Cafe, GVK 1 Mall road No 1 Banjara Hills. Part of worldwide chain. Excellent ambiance, check their website for events. Plenty of options are available with online booking facilities, with web based aggregator services like OYO rooms, Stayzilla, makemytrip, etc. providing good deals for advance bookings. There are plenty of Budget hotels at Kachiguda Near Venkutramana Theater. The price generally ranges from Rs. 1000 to Rs. 1500 for A/c Rooms. Kindly bargain at the hotels to get better price. Typically, serviced apartments have tie-ups with corporate professionals and give good rates to them. Companies may hire apartments on semi-permanent basis to house even their short term visitors. Like hotels, you reserve rooms by calling or writing to the property, you follow a check-in and check-out schedule, and you don't have to pay extra for services such as housekeeping, maintenance and utilities. Serviced apartments are usually 40-50% less expensive than hotels. Begumpet (lane beside ICICI Bank, near old airport road), ☎ +91 95 739 0009. Cpr Maple Court Plot No 11, Brindavan colony Durgam Cheruvu, Rd Madhapur, ☎ +91 98 8539 1679. India Post, a govt-owned enterprise, has its headquarters at Abids known as GPO. And its second biggest centre is located in Secunderabad. One can get a mobile with a calling rate of 1 paise/second for a local/national call. It is very easy to get a Prepaid mobile, which is very cheap to get and for calls. One needs to give a Photo ID proof and a photograph for prepaid as well as postpaid connection as per the Govt. regulations. Internet cafes are spread around town and most easily found in the city and residential areas. Charges vary between Rs 5-15/hr. Reliance WebWorld provides Broadband internet centres. Indian Railways is offering free WiFi to passengers for a half an hour duration at Secunderabad Railway Station per day. 17 WiFi locations have been set up between the Cyber Towers - Madhapur Police Station area, the Cyber Towers - Kothaguda junction area, and the Cyber Towers – Raheja Mindspace Circle areas. After selecting the public Wi-Fi network, a one time password (OTP) password will be sent to the mobile user, who can enjoy internet services of up to 750 mega bytes (MB) per day. For a longer stays with a laptop, it's better to get a Data plan either from Tata Indicom or Reliance Mobile, which are around Rs 1,000 a month or if you have WLAN (Wireless lan or WiFi) enabled laptops. There are many wireless public WiFi networks available in Hyderabad for free access to high-speed internet. Hyderabad has remained safe from terrorism of late, although an explosion suspected to be by the Indian Mujahideen happened in 2013, killing 17 and injuring over a hundred people. In 2007 and 2008, Hyderabad has been victim to multiple terrorist outrages in the form of bombings. These blasts have taken place at Mecca Masjid, Lumbini park and at Koti, places often frequented by travellers. Though the chance that you will be in danger is quite low, you should obviously make your own risk assessment. Rather than physical danger, it is more likely that the intrusive security will dampen your enjoyment of your Hyderabad vacation. Every shopping mall, cinema theatre and palace has metal detectors and security guards patting you down. The old city area was historically known as a communally sensitive zone and a venue for religious riots between Hindus and Muslims. It was common for the police to impose a curfew in that area while the rest of the city went about life without any problems. Old city continues to be at the heart of Hyderabad's crime wave and though many tourist attractions including Charminar are in this area, it is best to avoid late night visits, especially for single females or foreigners traveling alone. While there were fears of law and order issues before the formation of the Telangana State, such fears have been put to rest by the exemplary police forces here, who are both well equipped and citizen friendly, even taking complaints via Whatsapp, mobile app, and Facebook, and keeping complainants updated on the status of their complaints via the same media. Hyderabad also has an extensive network of CCTV cameras whose feed is used very frequently to swiftly solve crimes. Outside of these, Hyderabad is a rather safe metropolis. Muggings and violent crime are uncommon, most crimes involve thefts. Avoid staying out late at night, especially if you are a single woman. The usual tourist-oriented scams in India are not as bad in Hyderabad as they are in other places. However, foreigners will be hounded for money at tourist sites like the old city. Just ignore the beggars and they will go away. Should tourists run into any kind of problem they should immediately contact police at "100" or the emergency services at "108". The police personnel are extremely helpful and for foreign tourists it is even better. Traffic police can be found nearly at all major junctions and can be more effective than "108". Many hotels will change money for you at the front desk. However, they may not offer the best rates. It is best to change money at the city-based money changers than the ones located at the airports. You'll find many money-changing operations located in Saifabad, some with door-step service. It's also possible to call them and agree on a rate before the transaction. Eenadu is the most popular local language (Telugu) newspaper and as is Andhra Jyothy. The Deccan Chronicle is Hyderabad's oldest newspaper, and indispensable if you need to look up classifieds for, say, renting a house. The Times of India with its new office in Hyderabad has good local content and is increasingly widely read. For events, business listings and movie listings, fullhyderabad.com is popular. Siasat and Munsif are the main Urdu newspapers for the urdu speaking population. Modern medicine is widely available at pharmacies located around the city, and can also be ordered online from services such as Medplus. This page was last edited on 21 April 2019, at 01:34.